Everything now seems to be politicized with people spewing absolute-isms about every conceivable topic. Even about voicing political commercials. 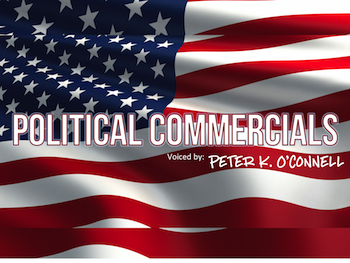 Among voice talents, there is usually an annual discussion (often held near election season) about a voice actor’s stance on voicing political commercials. An example of their thinking: A voice actor may be the voice of a soft drink company but not drink or even like the product. An example of their thinking: A voice actor will decline to do a political commercial for a candidate who position on an issue conflicts with hers (some voice actors who will not even voice a specific a political party). If you answered, “both” or “it’s an individual choice”, you’re correct. There is neither a correct nor simple answer. But I would also guess that as you read both options, as a voice talent, you identified more with one option versus the other. 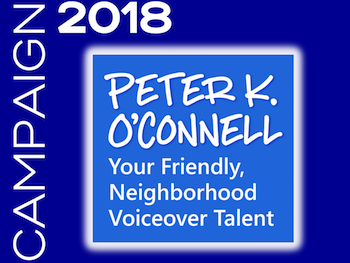 Every voice actor has his own moral compass and that gut instinct determines the voice talent’s comfort level working for an individual political candidate, a referendum or even a political party. Some voice talents are so disturbed by the political process or the conflict it incites that they won’t voice political commercials at all. I understand that thinking as well. And yet, there are few additional forms of media other than political commercials where the influence of a voice talent’s work is so greatly influences a targeted audience. Eliciting emotions, getting people to think and feel about a topic, product or service is the foundation of what a voice actor does. 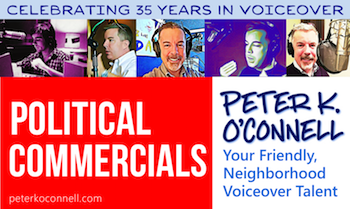 I am a voice talent for political commercials. What about you? You know what’s so funny to me, as a political voice talent? It’s not the politicians or referendums or the political action committees. Those are just grown-ups trying to do that which they think is right. Well, in a few cases, it is grown-ups behaving badly. But what I find so terribly funny about being a voice talent for political spots is that I myself am so completely not political. I’m just not. I am intentionally not affiliated with a political party. I don’t donate to political causes. I’m not a rally attender. I do vote, every election without exception. 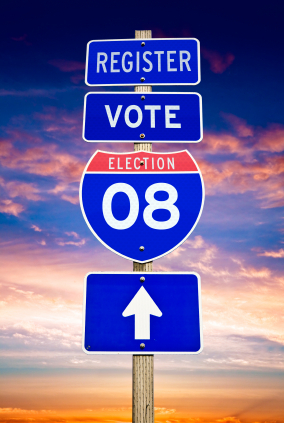 I am amazed when I hear how many people do not vote. People died for me so I’d have that right in the democracy of my nation! What the heck?! Vote people! Me being not very political doesn’t mean I don’t have opinions, I do. Every voice talent does. Every person does. I just don’t blast it upon the world (as I hear and see others do) Plus I stay far away from mentioning any thing political on social media. To me that’s just professional suicide, no matter what your job is. Nope, I just give the client the best and most appropriate read for the script. Work fast, be fun to work with and then get paid. It’s been a winning formula thus far. So what happens if I get a political commercial script that I really have a problem with? Likely what I’ll do is contact a fellow voice talent whose personal views maybe more in line with the script’s content and see if I can foster a connection. Why? First of all, this is a business transaction, it’s not meant to be personal. Some people see it otherwise, but I don’t. It’s business. Often times, also, the campaign managers or political consultants who send me scripts work on a wide range of campaigns. So while I may not work with them on one campaign, we may have no problem working together on another campaign. Politics is about relationships. Voiceover is about relationships. So I guess in a sense, I am a little political. Here’s a link to my political demo, if you’d like to listen. The thing with new demos is a lot like re-doing your kitchen. With a kitchen, maybe you change out your cabinet knobs…which now clashes with your floor so you’ll have to change the floor. And you might as well change out your appliances if you’re pulling up the floor and before you know it you’ve spent $25,000 because you changed $20 worth of knobs. Voice-over demos are a little like that too. But then I looked at the political demo page and felt something was missing. It didn’t call out “political commercials” well enough. Then I look at the other demo pages and saw the same pattern. So I drafted some graphic image ideas and settled on a format that has a unified theme but still allows for unique execution for each demo page. A graphic example is on the top of this blog post. The “brilliance” of all this likely won’t break the internet but it makes me happy and more importantly I believe will make for clearer concept comprehension for first time web site viewers. 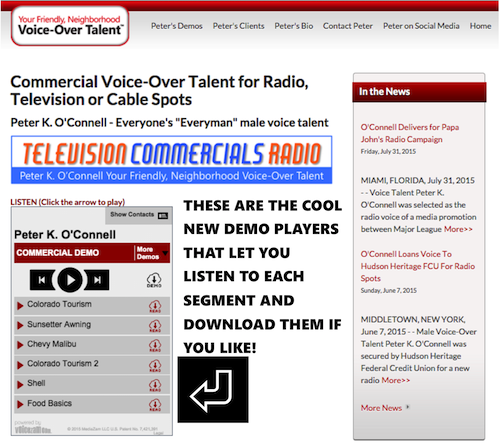 My friend John Florian who runs the on-line voice over news center Voice-Over Xtra! sent an email to me (and probably 1,000 of my closest friends) asking for some insight in to our workload for political voiceover projects during the 2010 mid-term elections that just blew through the U.S. like a cyclone. The purpose of the survey, which I took, is to gauge (among other things) what types of political advertisements most voice talents voiced this season. Positive or negative? Issue or attack ads? Funded by PAC’s or other groups etc. Nobody is asked to share their personal political beliefs or anything like that. The most interesting result I want to find out from this survey is whether voice talents on average will or will not voice spots for issues or politicians they do not believe in. Some people will say no and some will say…it’s just a job and as a voice actor, I need to act like I believe in this or that; it’s not an endorsement. I know for me, I have only one issue that I look at with possible political spots and if the spot or the candidate runs contrary to that belief, then I decline the business. Others might see things differently so I look forward to the survey results. So if you did a political spot this year, go take the survey here.